Hans Böcklin was the son of the famous painter Arnold Böcklin. At school he was already drawing caricatures and his father educated him as a painter. He lived in Antwerp and Brussels and attended the Académie Julian in Paris where Lefebvre and Boulanger were his teachers. In 1887 he settled in Zürich and there he worked as a painter. Later in life a serious illness made it improssible for him to work. He died in 1943 in Munich. 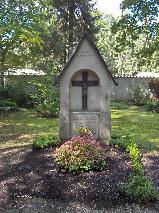 The grave of Hans Böcklin at the Waldfriedhof, Munich.